A Thanksgiving dinner for your family is one thing, but Thanksgiving dinner for 2,000 people is another. Maybe you haven’t thought much about Thanksgiving just yet. Here at Fred Jordan Missions, we’re already preparing for our annual Thanksgiving Day Banquet on the Streets. We’ll be cooking more than a ton of turkey legs—along with candied yams, green beans and dressing. But our homeless and hungry guests will receive more than a delicious meal at Fred Jordan Missions this Thanksgiving. They’ll hear the life-changing message of salvation, the good news of Jesus Christ who changes lives for eternity. We’ll also be giving thanks to God for the people who provided the meal—people like you. Fred always said that a family Thanksgiving is wonderful, but we need to make sure the poor have been served first. 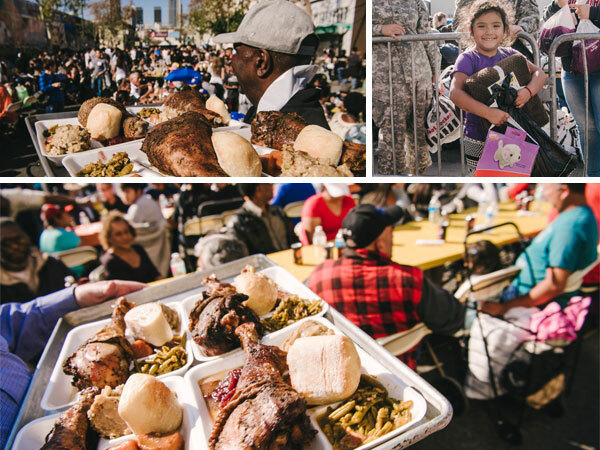 Thanksgiving on Skid Row is an important opportunity to share the gospel and God’s love with lost, hurting and homeless people who are in desperate need of hope and help. Most of the people on these streets don’t have a family to spend the holidays with. But with the help of caring friends like you, they can be part of the Fred Jordan Missions family this Thanksgiving. Would you join us in feeding hungry people on Skid Row with a gift to Fred Jordan Missions? A gift of $22 will provide Thanksgiving meals for 10 hungry people. And $44 will serve meals to 20 of our homeless guests on Skid Row. A gift of $110 will make Thanksgiving dinner possible for 50 precious souls in need of food and hope. With the help of ministry partners like you, we’ll welcome the homeless, the poor, the sick and the lonely to our Thanksgiving celebration. Thank you for bringing hope and help to people who desperately need to know that God loves them. May God bless you for your compassionate heart toward the poor.